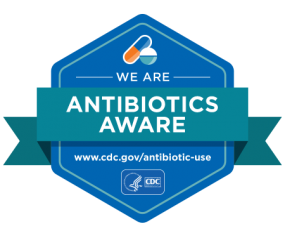 The North Carolina Department of Health and Human Services' Division of Public Health is an active participant in the Be Antibiotics Aware: Smart Use, Best Care (formerly Get Smart about Antibiotics) Campaign. Antibiotic resistance – when bacteria stop responding to the drugs designed to kill them – may be the single most important infectious disease threat of our time. We risk turning back the clock to a world where simple infections can kill people as they did a century ago because we have no way to treat them. Antibiotics are the most important tool we have to combat many life-threatening bacterial diseases. Patients, healthcare providers, hospital administrators, and policy makers must work together to employ effective strategies for improving appropriate antibiotic use – ultimately saving lives. Antibiotics do not cure viruses, such as those causing colds or flu, most coughs and bronchitis, runny nose, and sore throats not caused by strep. Increased antibiotic resistance is compromising the effectiveness of antibiotics. Patients, healthcare providers, hospital administrators and policy makers must work together to employ effective strategies for improving appropriate antibiotic use - ultimately saving lives. US Antibiotics Awareness Week 2018 is November 12-18. Information about planned activities to encourage the public and healthcare providers to use antibiotics carefully and appropriately will be forthcoming. 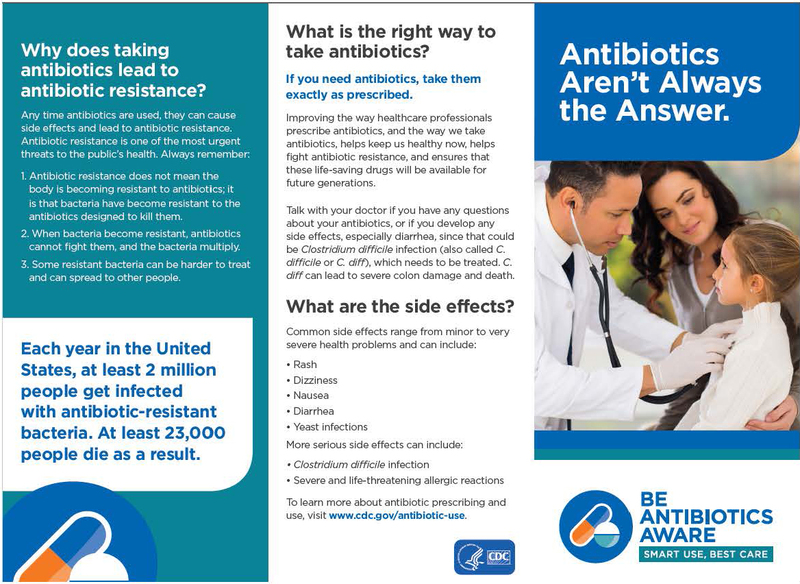 Antibiotic Ally/Provider Posters: The Be Antibiotics Aware Campaign, formerly known as NC Get Smart Campaign, is reminding clinicians to appropriately prescribe antibiotics and display commitment posters throughout their facility. 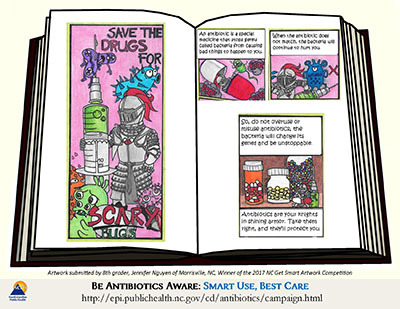 Be Antibiotics Aware Campaign Artwork Competition: To celebrate U.S. Antibiotics Awareness Week, 2017, the Be Antibiotics Aware Campaign hosted our second Kids’ Artwork Competition. Forty children submitted artwork, and 5 winners were selected. The winning artwork will be displayed in healthcare facilities and schools across the state. See the winning posters below. To order, send an email. Save November of this year as we have another artwork contest on the calendar! More information to follow. 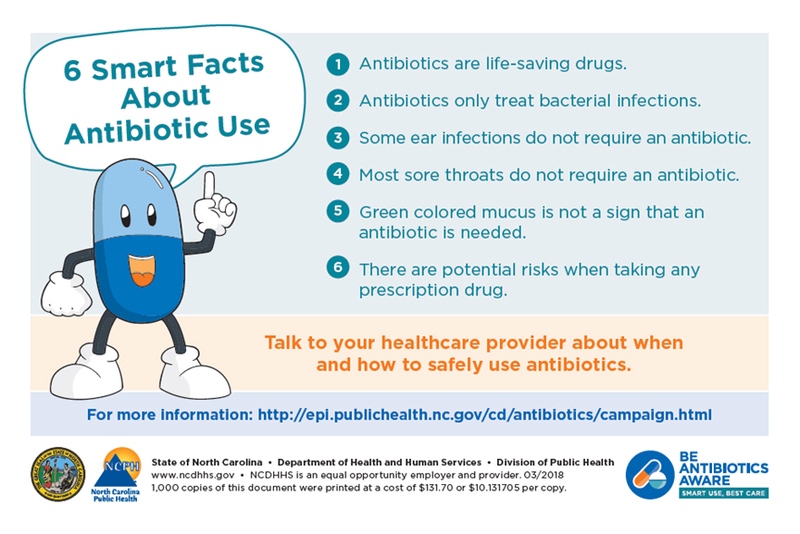 6 Smart Facts: The NC Get Smart Campaign created a useful handout for patients describing key facts on antibiotics and infections. Adult patients and caregivers such as parents. This brochure is planned for use in doctor's offices, clinics, and other healthcare facilities. It is intended to raise awareness about the right way to take antibiotics and answer questions on when antibiotics are needed and when they are not. It also provides guidance on how to stay healthy. To receive printed versions of these materials, email nchai@dhhs.nc.gov.